Crops won't grow on certain blocks. 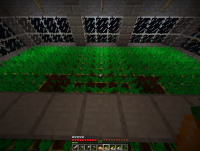 Bug: Wheat, carrots, and potatoes sometimes won't grow on certain blocks. In the picture you can see two potato crops that haven't begun to grow surrounded by fully grown potatoes. To Reproduce: Build a farm and let it go for a while. When all the crops should be fully grown, look for baby plants. Edit: Melons and pumpkins also won't grow on certain blocks.